Because of the water temperature (between 4 °C and 0 °C in fresh water, approximately -1.9 °C for normal salinity sea water), exposure suits are mandatory. The risk of attack by predators and aggressive wildlife should be considered. Polar bear, walrus, and leopard seal are potential hazards within their ranges. Some divers choose to "de-tune" their regulators by lowering the intermediate pressure but this is not recommended and most dive shops will not do this for you. 1 2 3 4 Lang, M.A. & J. R. Stewart (eds.). (1992). 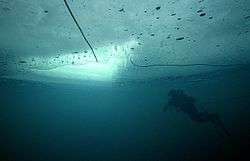 AAUS Polar Diving Workshop Proceedings. United States: Scripps Institution of Oceanography, La Jolla, CA. p. 100. Retrieved 2008-08-07. 1 2 3 4 5 6 7 8 9 10 11 12 13 14 15 16 Lang, M.A. and M.D.J. Sayer (eds.) (2007). 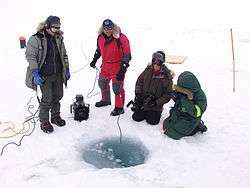 Proceedings of the International Polar Diving Workshop. Svalbard: Smithsonian Institution. pp. 211–213. Retrieved 2008-08-07. ↑ Clarke, John (2015). 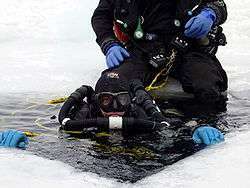 "Authorized for cold-water service: What Divers Should Know About Extreme Cold". ECO Magazine: 20–25. Retrieved 2015-03-07. ↑ Salzman, WR. "Joule Expansion". Department of Chemistry, University of Arizona.